Records show the system had persistent issues, but the company downplayed them as a factor even while hundreds of customers complained about big spikes in their bills. Central Maine Power Co. has known for months that its new billing software was rife with problems, raising questions about its assertion in April that its software has nothing to do with why hundreds of customers had unusually high bills over the winter. More than 250 pages of documents, some confidential, reviewed by the Portland Press Herald show persistent problems with CMP’s new billing system, a situation that was downplayed in early April by a top manager, who said the new billing system was not contributing to extraordinarily high bills for some 1,500 customers. The internal documents, which were filed with the state Public Utilities Commission, portray a company desperately trying to understand problems with its new billing system and how to fix them. CMP switched from its 27-year-old mainframe computer system on Oct. 30, 2017 – the same day a powerful windstorm knocked out power to more than 400,000 CMP customers. The documents filed with the PUC are available to the public on the agency’s website, but are difficult to find in the thousands of pages on the site. They were sent to the Press Herald by a confidential source. • Customers who paid their bills with an auto-pay feature were being unenrolled from auto-pay. • Some customers saw double usage on their bills, but zero cost. • Some so-called net energy accounts, such as customers with solar panels, had very high estimated bills. • SimplePay customers, who pay the same amount each month to smooth out their bills, were dropped for minimal non-payment. • Bills couldn’t be seen on iPhones. The documents also show that staff from CMP and companies affiliated with Avangrid, CMP’s parent company, worked diligently, racking up overtime and weekends, to track down complex software errors. This is a copy of an email warning that the billing problems could lead to an investigation. 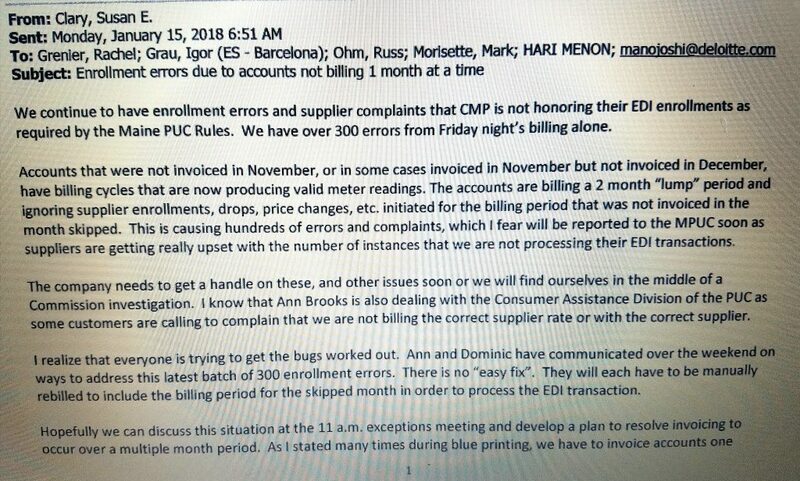 A Jan. 15 email from Susan Clary, CMP’s director of electric supply, to Rachel Grenier, who heads customer services, and to other managers discusses the topic of enrollment errors and supplier complaints stemming from electronic data exchange glitches in November and December. “The company needs to get a handle on these and other issues soon or we will find ourselves in the middle of a (Public Utilities) Commission investigation,” Clary wrote. In February, according to a confidential Avangrid presentation, managers tried to figure out how to assemble sufficient resources to handle the billing system problems, as well as issues with customer service functions, meter reading, and finance and accounting. The glitches had resulted in delayed billing to customers, high call volumes and long wait times, and increased complaints to the PUC, it noted. These exchanges between CMP employees call into questions the assertions made last month by CMP’s top management that an internal audit of more than 1,500 customer complaints found no problems with the company’s systems that would explain unusually high electric bills. The company said it had reviewed about 25 percent of the 1,580 complaints of excessive bills it received over the winter. Auditors have so far found no anomalies in the company’s new billing software or its smart meter network to explain bills that for some customers were two to three times what they had been during the same period in the previous year, CMP President and CEO Doug Herling said April 5 in a conference call with reporters. On Thursday, CMP spokesman John Carroll echoed Herling’s assessment that the new billing system has not been a factor in high bills. “We have consistently found that the billing information regarding usage and amounts due are accurate,” Carroll said Thursday evening in a telephone interview. Carroll said the email from Clary about CMP ending up in the middle of a PUC investigation reflects a company whose employees realized there were problems with the new computer system and were trying to solve them. “If you knew that an organization was going through major problems you would expect or hope that company was trying to solve the problem,” he said. Carroll said CMP staffers realize that any emails or documents they author must be filed with the PUC. Carroll, who was not part of Herling’s April 5 conference call with reporters, could not answer why CMP’s president did not disclose the extensive billing problems at that time. In a follow-up email, Carroll pointed to an April 17 op-ed by Vicky Kelsall, a CMP vice president, that appeared in the Press Herald, in which she said the company was working with the PUC to identify what caused the unusually high bills and outlined some of the issues the company encountered in switching over to the new billing system. “While we have found some errors that occurred in the changeover to our new system, we can report that the core functions of the system are working properly,” she wrote. But the state’s public advocate, Barry Hobbins, said Herling’s failure to mention that there were significant software problems is alarming. He said there is no excuse for allowing hundreds of customers, who believed their power bills were excessive, to suffer during the middle of a harsh winter when the company knew there were problems with its new billing system. Hobbins, who has been involved this week with a rate case involving Maine’s other major utility company, Emera Maine, said he has not had time to delve into the documents that were obtained by the Press Herald. The PUC is poised to hire at least one consultant with the experience to conduct what’s called a forensic audit – a comprehensive, technical examination of CMP’s meter and billing systems. Work is scheduled to begin May 15, and wrap up no later than Dec. 31. Hundreds of CMP customers are in an uproar over unusually high bills that have been coming in since November. Some people say their bills have more than doubled or tripled, and they’re not convinced by explanations that CMP’s changeover to a new billing system, the early winter cold spell and an 18 percent hike in standard-offer electric rates in January combined to cause the spike. The PUC’s staff also has been conducting a data-request audit with CMP, searching for answers. CLARIFICATION: This story was updated at 2 p.m. May 7, 2018 to clarify that the information reviewed by the Press Herald contained some confidential documents, but is available on the PUC website.